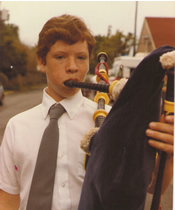 My piping journey began in 1981 when I enrolled in 4th Grade at St. Thomas’ Episcopal School in Houston, Texas. I can remember my mother mentioning to me before the first day of class that the school had a bagpipe band but I had no idea what that was. About the third week of school one of the seniors walked into my classroom and asked who was interested in joining the band and learning the bagpipe. A couple of my friends raised their hand so I did as well (I guess it was peer pressure at work). 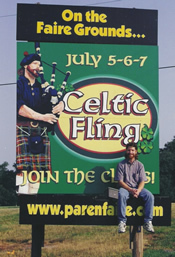 While the senior was putting my name on the band list I remember asking him, “By the way, what is a bagpipe?” That is how my journey to playing the bagpipes began – it had nothing to do with the Irish and Scottish heritage in my family. My first instructor was Campbell Naismith, whose wife was a highland dancing instructor at the school. In the beginning I wasn’t a very serious student, habitually arriving to lessons without my chanter, and in fact, just about didn’t make it through that first year. However, the tide turned when, after coming to class three days in a row without my chanter, Mr. Naismith told me if I didn’t bring it the next day I would be kicked out of the band. Needless to say, after this wake-up call I began to take things more seriously and truly dedicated myself to the instrument. When I started 5th Grade in 1982 Campbell Naismith left St. Thomas to move to California and Albert McMullin took over as band director. It was during this year that I made the transition from practice chanter to bagpipe and started marching with the band. At the start of 6th Grade Mr. McMullin left St. Thomas, leaving the band without a director during that year. However, Doug Frobese, who was a senior that year, ran the band until Mike Cusack graduated from college. Mr. Cusack took over at the beginning of 7th Grade. His leadership soon built the band into the premiere juvenile pipe band in the world. 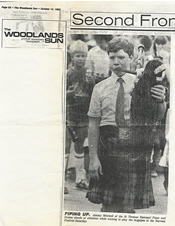 In the summer of 1985, just after I had finished 8th Grade, Mr. Cusack took the band over to Scotland to compete in the World Pipe Band Championships. The band placed 1st in the Juvenile Division and this marked the first time an American band had ever won a World Pipe Band Championship. 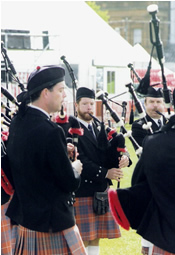 For the whole month of August the band toured Scotland and competed at various Highland Games. It was during that month I was in Scotland that I was able to see where the bagpipes came from and to learn about the Scottish culture. This trip to Scotland made me want to work even harder at becoming the best player I could be. 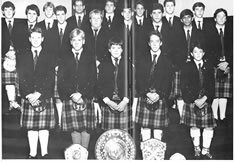 After graduating from St. Thomas in 1989 I started college at the University of Houston and joined the Hamilton Pipe Band in the fall of that year. 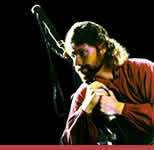 At that time the Hamilton Pipe Band was led by Lars Sloan, although he would leave the band at the end of 1989. During this period the band played at the Texas Renaissance Festival, my first time to play at this type of event, and would be a foreshadowing of what was to come a few years later. When Lars left, Donald MacPhee took over as Pipe Major, and many changes were soon to come. 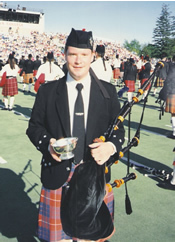 Donald MacPhee wanted the Hamilton Pipe Band to focus on competing and almost overnight turned us from a street band to Grade III champions at the 1990 Stone Mountain Highland Games in Atlanta, Georgia. I was also fortunate to win the Grade I trophy and Amateur Piper of the Day. In 1991 the band returned to Stone Mountain and again won first place in Grade III. 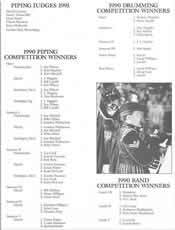 Things were really falling into place for the band and we would go on to win the Grade III and Grade II United States Championships in Alma, Michigan, and I won some solo awards there as well. In 1993, the Hamilton Pipe Band went to Scotland to compete and won best overseas band in Grade II. 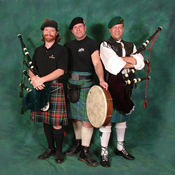 The band would also finish first in the Celtic Classic competition in Bethlehem, Pennsylvania, and first at the Santa Rosa Highland Games in California. 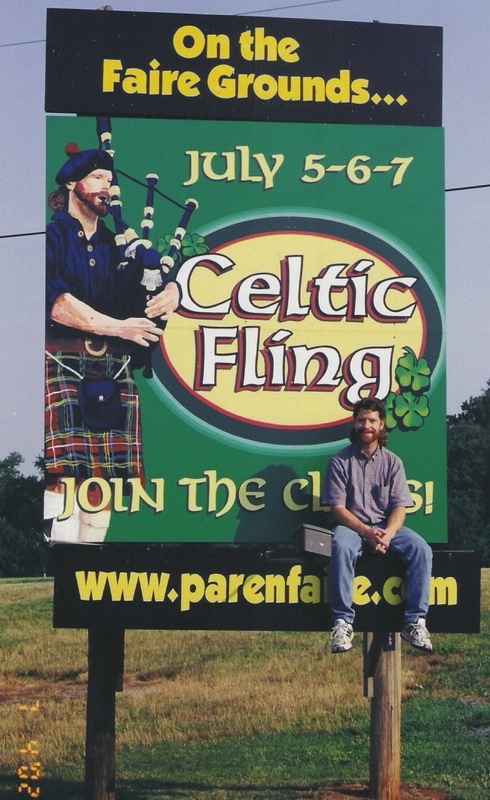 In 1995 I graduated from college and also joined a Celtic group called The Rogues. 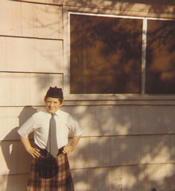 It was at this time that I knew piping was what I wanted to do for a living. For the next four years I would divide my time competing with the Hamilton Pipe Band and playing with The Rogues. In the fall of 1995 The Rogues recorded their first album and performed at the Texas Renaissance Festival. At the end of 1995 I left The Rogues, but was back again at the end of 1996. 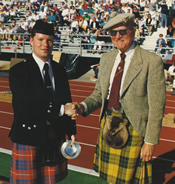 In early 1998 Donald MacPhee left the Hamilton Pipe Band to move to Scotland and Doug Frobese took over as Pipe Major. In August of that year the Hamilton Pipe Band traveled to Scotland and we won the Grade IIIA World Pipe Band Championship. This was my second time to win a World Championship and we returned in 1999 to place 3rd in the Grade II World Championships. After this accomplishment I left the Hamilton Pipe Band to focus on playing in The Rogues. During my time with The Rogues we made five albums, toured throughout the United States, and performed in Canada and Scotland. At this time I also started teaching the bagpipes and several of my students have won trophies and awards in competition. This is also when I started composing tunes, several of which are on The Rogues’ albums. 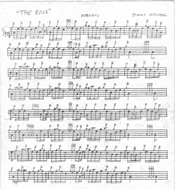 My first composition, “The Rock,” was even played by a pipe band at the World Pipe Band Championships. At the end of 2004, after nine years, I left The Rogues to begin my solo career and in 2005 my fiancée and I moved to Forney, Texas. Today, I find myself very busy with weddings, funerals, church services, golf tournaments, cultural events, anniversary and retirement parties, just to name a few. As always, I continue to look forward to what the future holds in my piping journey!